Why contemporary art fails to come to grips with digital. A response to Claire Bishop. Scatter (2008) by Marko Peljhan – commissioned by AV Festival 08. This month, Art Forum published a very timely, and beautifully written essay by Claire Bishop entitled, Digital Divide: on contemporary Art and New Media“. However, I would contend that one of the central reasons the contemporary visual art world hasn’t come to grips with digital, is that it explicitly disavows the visual art that has. Bishop’s article is emblematic of this. She begins by rightly saying that “contemporary art [has] been curiously unresponsive to the total upheaval in our labor and leisure inaugurated by the digital revolution”. 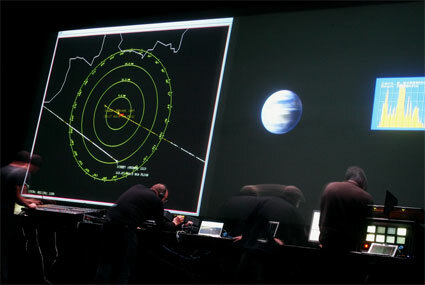 It is this so-called ‘specialist sphere’, which includes many artists who exhibit widely within contemporary art forums – such as Rafael Lozano Hemmer, Trevor Paglen, Cory Arcangel, to name but a few – that has consistently produced works which do address the “total upheaval in our labor and leisure inaugurated by the digital revolution” with acuity and intelligence. To rule out a discussion of this practice perpetuates the very problem Bishop is attempting to address within the article. This becomes clear later in the essay, where Bishop makes awkward statements such as, “the digital, by contrast, is code, inherently alien to human perception”. Code is written by humans. It is a little absurd to describe something created by people as “inherently alien to human perception”. It’s certainly not alien to the humans – who are, it should be noted, often artists – that write it. Later, in Bishop’s analysis of contemporary research driven art, she concludes that there’s a turn away from examining “the social, political, and economic conditions of the present”. Where does that leave the work of Paglen, for example, or Marko Peljhan (pictured), or many others we might cite, who create rigorous research-driven work that examines how our contemporary human experience is being shaped right now by (for example) covert military technologies? The problematic point of the article resurfaces at this juncture. Perhaps Bishop deems these artists too close to the specialist “sphere of new media art” to warrant relevant consideration. Towards the end of the piece, Bishop asks, “is there a sense of fear underlying visual art’s disavowal of new media?”. A somewhat ironic, or perhaps obsolete, question given that Bishop herself has disavowed it right from the beginning of the article. Bishop concludes by perhaps providing a reason for both the fear and the disavowal:”at its worst [ the digital revolution] signals the impending obsolescence of visual art itself”. I greatly enjoyed reading the article, and respect Claire Bishop enormously, and am grateful for these issues being raised in Art Forum. But I think it’s highly problematic to dismiss the practices of so many visual artists who do address the fundamental societal shifts brought about by the proliferation of digital technology. It does tempt one to wonder if that obsolescence Bishop alludes to, is really the worst case scenario.